Ransomware is emerging as a predominant online security threat to both home users and businesses, with numerous reports appearing every day on ransomware attacks against organizations across the globe. SenseCy analysts have prepared a short list of security measures recommended for any business to help avoid these attacks. Check out the tips and stay safe! In 2015 we saw an active underground trading of exploits, botnets and spam tools. The number of Ransomware sales were much lower than it was expected by cyber security experts. 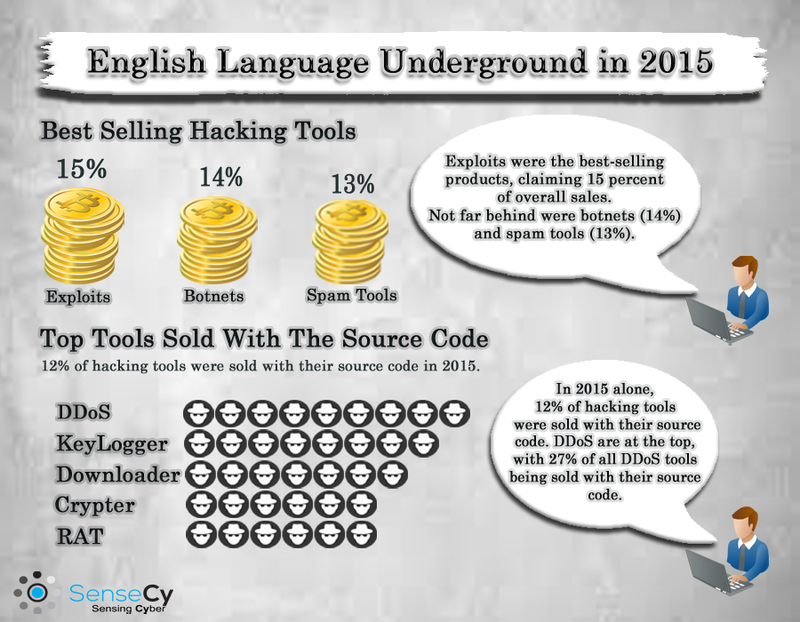 Investigate the key trends in hacking tools commerce observed on the English-language underground in 2015 from our short Infographic. SenseCy’s 2015 Annual CTI Report spans the main trends and activities monitored by us in the different cyber arenas including the world of Arab hacktivism, the Russian underground, the English-speaking underground, the Darknet and the Iranian underground. In addition, we have listed the major cyber incidents that occurred in 2015, and the most prominent attacks against Israeli organizations. 2015 was a prolific year for cyber threats, so before elaborating on our main insights from the different arenas covered here at SenseCy, we would like to first summarize three of the main trends we observed in 2015. Firstly, when reviewing 2015, we recommend paying special attention to the evolving world of ransomware and new applications of this type of malware, such as Ransomware-as-a-Service (RaaS), and ransomware targeting cloud services, as opposed to local networks and more. Secondly, throughout 2015, we witnessed cyber-attacks against high-profile targets attributed to ISIS-affiliated hackers and groups. One such incident was the January 2015 allegedly attack against the YouTube channel and Twitter account of the U.S. Central Command (CENTCOM). Thirdly, 2015 revealed a continuing interest in the field of critical infrastructure among hackers. Throughout the year, we witnessed multiple incidents of critical infrastructure firms allegedly targeted by hackers, prompting periodic analyses addressing the potential vulnerabilities of critical sectors such as energy, water, and more. Taking into consideration the advanced capabilities and high-level of understanding of such systems required to execute such attacks, many security firms and experts are confident that these attacks are supported by nation-state actors. During 2015, we detected several indications of anti-Israel cybercrime activity on closed platforms frequented by Arabic-speaking hackers. It will be interesting to see if these anti-Israel hacktivists that usually call to deface Israeli websites or carry out DDoS attacks will attempt to incorporate phishing attacks, spamming methods and tools into their arsenals. Notwithstanding, Islamic hacktivism activity continues unabated, but without any significant success. The prominent products currently traded during 2015 on Russian underground forums are ransomware programs and exploits targeting Microsoft Office. With regard to banking Trojans, we did not notice any major developments or the appearance of new Trojans for sale. The PoS malware field has not yielded any new threats either, in contrast to the impression given by its intensive media coverage. Mobile malware for Android devices is on the rise as well, with the majority of tools offered being Trojans, but we have also detected ransomware and loaders. Prices on the Russian Underground have remained unchanged during the past two years, due to the vigorous competition between sellers on these platforms. Different kinds of services, such as digital signing for malicious files, injections development for MitM attacks and crypting malware to avoid detection were also extremely popular on Russian forums. Our analysis of password-protected forums revealed that exploits were the best-selling products of 2015. 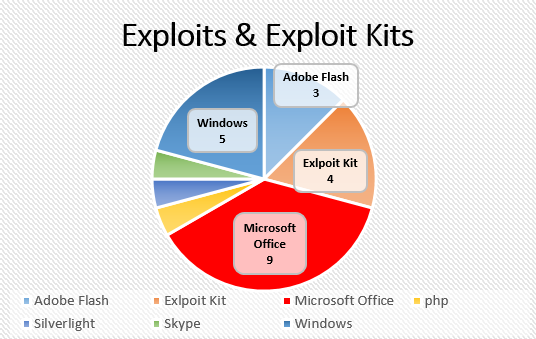 This comes as no surprise, since exploits are a vital part of almost every attack. The Darknet made the headlines on multiple occasions this year, mostly owing to databases that were leaked on it and media reports recounting FBI activities against Darknet users. Furthermore, this year saw increased activity by the hacking community on the Darknet, manifested in dedicated markets for the sale of 0-day exploits and the establishment of several new hacking forums. With regard to Iranian threat actors, 2015 was a highly prolific year, with attack groups making headlines around the world. Delving deeper into the Iranian underground, we uncovered several interesting trends, some more clear than others. One main development in 2015 was the persistent interest in critical infrastructure, with underground forum members sharing and requesting information related to industrial control systems and other related components. With Iranian actors becoming increasingly drawn to this field, we assess that this trend will remain relevant in 2016 as well. Another growing phenomenon is the stunted life cycles of Iranian cyber groups, many with a life-span of just several months. This trend makes it difficult to monitor the different entities active in the Iranian cyber arena and their activities. To understand the constant changes in this realm, this short life cycle trend must be taken into consideration and the Iranian cyber arena continuously monitored. That said, we must not overlook one of the most prominent characteristics of Iranian attack groups – confidentiality. With attacks attributed to Iranian actors becoming more sophisticated and high-profile, we believe that the divide between medium-level practices of malicious activity and alleged state-sponsored activity by attack groups will remain pronounced. On the other side of the Arab-speaking cyber world, we can find ISIS and its evolving cyber activities. There is disagreement between intelligence firms and cyber experts about the cyber offensive capabilities of the Islamic State. In addition, there is a high motivation among hackers that identify with the group’s fundamentalist agenda to carry out cyber-attacks against Western targets, especially against those countries actively involved in the war against the group in Iraq and Syria.